As of 2009, still known as by leaps and bounds the greatest quarterback in Chicago Bears history, 59 years after he retired. 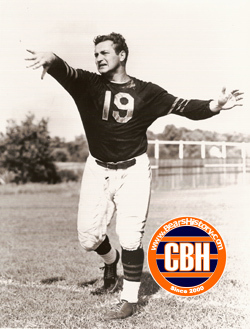 Scouted and visited by George Halas while he played at Columbia University, Luckman was picked by the Bears with the second pick in the 1939 draft. The following season, Luckman led the Bears to their first of four championships. Still leads Bears in passing yards, touchdowns and quarterback rating. Passed for seven touchdowns in a game in 1943, tying an NFL record. Remained close friends with George Halas throughout his life. Former Chicago Bear Al Baisi once told me Halas sent linemen along with Luckman wherever he went in public to protect him. Luckman served as an assistant coach for Halas and the Bears for years following his retirement. Elected to the Pro Football Hall of Fame in 1965. Died in 1998 at the age of 81.